PARIS — As the global manhunt intensified for an accomplice linked to the deadly Paris attacks, two men who were allegedly with him hours after the assault were charged with participating in a terrorist activity, Belgian officials said Tuesday. Hamza Attou and Mohammed Amri are accused of picking up 26-year-old Salah Abdeslam from Paris and taking him back into Belgium early Saturday, Belgian prosecutor spokesperson Eric Van Sypt told NBC News. They were detained after witness testimony and video footage pointed to a black Belgian rental car that stopped for a border check on Saturday morning but was allowed to drive on, Van Sypt said. Security forces across Europe have been trying to locate Abdeslam, whose brother was among the dead attackers and is described as "dangerous." Attou and Amri told investigators they were merely called and asked to pick up Abdeslam and drive him back to Belgium, according to Van Sypt. The men were the only two of seven people detained Saturday after police swept into the Molenbeek area of Brussels. 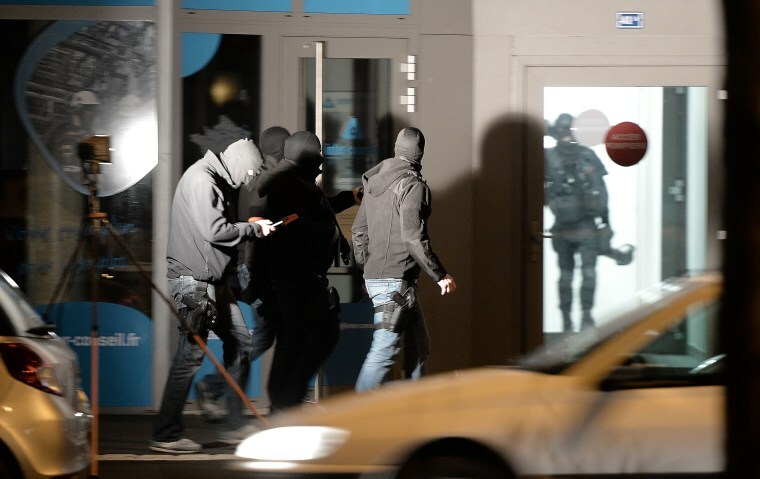 German authorities also confirmed Tuesday that three people were arrested near the city of Aachen in connection with the ongoing investigation into the Paris attacks. However, Abdeslam was not among them. The charges and latest arrests came as France pounded more targets in Syria and launched 128 raids overnight. France has vowed "merciless" retribution for the ISIS-claimed attacks Friday which killed 129 people. Seven terrorists also died. Another of Abdeslam's brothers, Mohammad, was briefly detained in Belgium. He told reporters following his release that he doesn't know where his brother is — or if he would' "dare" to turn himself in. "My family and I are very moved by what's happened. We found out about it from the television as many of you did," Mohammad Abdeslam said. "And we never thought that one of my brothers could be linked to this attack." With no sign of Salah Abdeslam, Belgian Interior Ministry's Crisis Center raised the country's terrorism threat level from two to three, or "severe." A top French official told NBC News on Monday that police stopped and questioned Abdeslam near the Belgian border hours after the attacks, but released him because information about an international warrant for his arrest hadn't reached them. France's prime minister conceded Tuesday that authorities still don't know how many people were involved in the attacks. "There might be accomplices in France," Manuel Valls told France Info Radio. As Secretary of State John Kerry met with President Francois Hollande, the French nation was emerging from three days of national mourning on Tuesday. The scale and coordination of the attacks have prompted questions over how security services failed to prevent them. Valls — who said some victims' bodies have yet to be identified — pushed back against criticism of the security services and reiterated the nation is at war against ISIS. That was evident in confirmation from the French government that warplanes dropped 16 more bombs on ISIS' de facto headquarters of Raqqa, Syria, overnight. The strikes hit an ISIS command center and a militant training center, the Ministry of Defense said in a statement. It marked the second straight day of French airstrikes on Raqqa. Reuters and Carlo Angerer contributed.